The area around the house is now ready for planting the grass. But before any seeding can be done, our sprinkler system needs to be up and running. Yesterday a guy who does sprinkler work came to the house and he says he'll be able to do the work this week. The sprinkler pipes has already been laid in the ground quite some time ago. 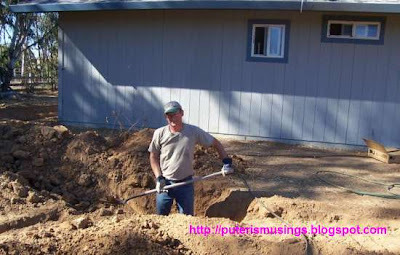 Doug had someone come in and do the trenching but he did all the pipe laying himself. This was about two years ago! So what this sprinkler guy has to do is locate all the spots where the sprinkler heads will have to go and fit the sprinkler heads at those spots. Once that is done, we'll have to hire another person do the hydro seeding. The sprinkler guy knows someone who can do the work and he's going to recommend this person to us. Hopefully everything can be done before it gets too cold, and the growth of the seeds affected by the cold. I am really looking to a green lawn instead of weeds. Puteri, you'd better explain that's me in the ditch (2 years ago?) and not the sprinkler guy. People will be wondering what kind of sprinklers are going in! Actually, your photo is of me working on a deeper trench for the main water line which supplies the sprinkler lines and a fire valve. The trencher guy made the trenches with his machine but I had to dig out the dirt that fell back in. Quite a bit of done work out trying to get ditches cleaned out and pipes in the ground before the winter rains hit. I made it, but just barely. That's what the date on the picture says, 2005, unless the date was wrong? All the dates on the pictures taken of the trenches say 2005. Ya, ya, that's you! Heheh.